Maverick by Sigma continues the success story and was awarded third place, in the competition Agency of the Year. Maverick has grown and therefore also advanced to the category Digital Agency’s 50+ MSEK. Four years ago, Maverick by Sigma was based inGöteborg and had 27 employees. 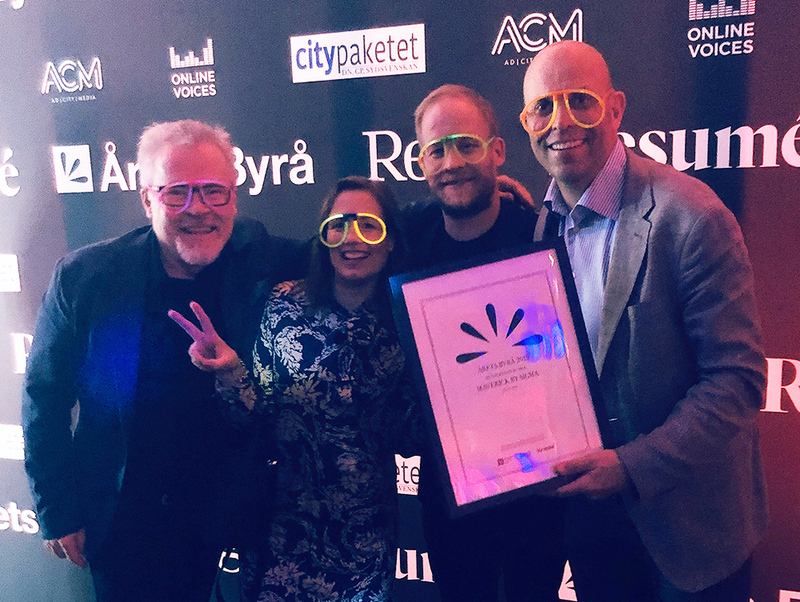 Today, the agency has grown and is also well established in Stockholm and Malmö, with over 80 employees in the three cities.The award in the Agency of the Year shows that, in this short time, the agency has succeeded to establish as one of the leading digital agencies in Sweden. – We are incredible proud to be on the price podium as Agency of the Year. This acknowledgment is the finest you can get, as it is based on our customers’ judgement. It shows that we have managed to deliver both high creativity and high quality, during our ongoing growth, says Henrik Askervi, Head of Maverick by Sigma. On February 21st the competition Agency of the Year 2019 was hosted at the München Brewery in Stockholm, in cooperation with Resumé. The competition is considered the biggest in the Nordic advertising industry, regarding customer satisfaction. About 300 communication agencies in Sweden and the other Nordic countriesare evaluated by their clients. The result is based on over 4.000 interviews. – It is very honourable to get this kind of recognition from the customers, and that they really appreciate our efforts to contribute for a better tomorrow. I am very proud of the work that we do. This award is a receipt that proves that everyone at the agency is doing an excellent work, Henrik Askervi emphasizes. Caption: Maverick by Sigma – The price ceremony at Agency of the Year 2019. From the left: Håkan Larsson, Linda Woxneborn, Peter Knapp och Henrik Askervi.